Montreal, Canada (Jan 30, 2019) AlazarTech, a manufacturer of high-performance, low-cost PC Based Instruments, today announced the release of AlazarTech ATS®9130, a dual-channel 50 MS/s, 12 bit waveform digitizer based on the single-lane Gen1 PCI Express bus. ATS9130 features two simultaneous analog input channels that can each be sampled at rates up to 50 MS/s with 12 bit vertical resolution. Each channel has 25 MHz of full power analog input bandwidth and up to 8 Megasamples of on-board acquisition memory buffer. With software selectable attenuation, users can achieve an input voltage range of ±40 mV to ±20 V.
“ATS9130 is a continuation of our effort to provide cost-effective yet powerful products to OEMs.”, stated Muneeb Khalid, President of AlazarTech. “ATS9130 provides data streaming, a feature that is usually absent in products in this price range”. The unit occupies only one half-length PCI Express slot, making it very easy to integrate it into a customer’s system. OEMs can integrate the ATS9130 PCI Express digitizers into their own systems very easily using the Windows® and Linux® compatible ATS-SDK Software Development Kit. This SDK includes sample programs written in C/C++, Python, MATLAB®, and LabVIEW®. 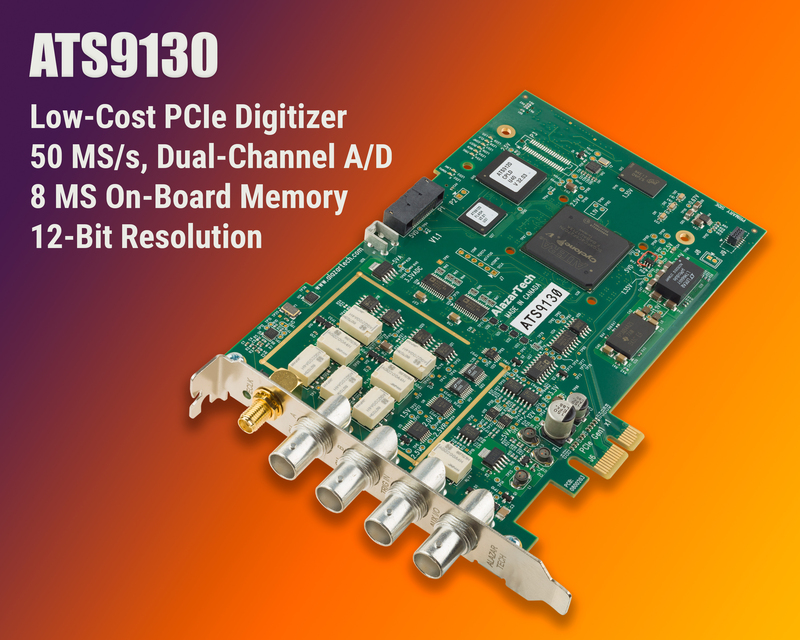 ATS9130 PCI Express digitizers are also compatible with ATS-GPU and ATS-GMA software libraries developed by AlazarTech that allow users to do real-time data transfer from ATS9130 to a GPU card at full bus speed and digital signal processing. ATS9130 is available immediately from stock. U.S. prices start at $1,995 in single quantity. Volume discounts are available. International prices may be higher.